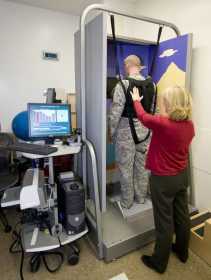 Denis Poroy ~ Associated Press Dr. Kim Gottshall, right, tested the balance of U.S. Army Sgt. Ryan Kahlor, left, Feb. 6 at Balboa Navy Medical Center in San Diego. Kahlor's hearing was damaged by exposure to multiple blasts in Iraq. SAN DIEGO — Soldiers and Marines caught in roadside bombings and firefights in Iraq and Afghanistan are coming home in epidemic numbers with permanent hearing loss and ringing in their ears, prompting the military to redouble its efforts to protect the troops from noise. Hearing damage is the No. 1 disability in the war on terror, according to the Department of Veterans Affairs, and some experts say the true toll could take decades to become clear. Nearly 70,000 of the more than 1.3 million troops who have served in the two war zones are collecting disability for tinnitus, a potentially debilitating ringing in the ears, and more than 58,000 are on disability for hearing loss, the VA said. "The numbers are staggering," said Theresa Schulz, a former audiologist with the Air Force, past president of the National Hearing Conservation Association and author of a 2004 report titled "Troops Return With Alarming Rates of Hearing Loss." One major explanation given is the insurgency's use of a fearsome weapon the Pentagon did not fully anticipate: powerful roadside bombs. Their blasts cause violent changes in air pressure that can rupture the eardrum and break bones inside the ear. Also, much of the fighting consists of ambushes, bombings and firefights, which come suddenly and unexpectedly, giving soldiers no time to use their military-issued hearing protection. "They can't say, 'Wait a minute, let me put my earplugs in,'" said Dr. Michael E. Hoffer, a Navy captain and one of the country's leading inner-ear specialists. "They are in the fight of their lives." In addition, some servicemen on patrol refuse to wear earplugs for fear of dulling their senses and missing sounds that can make the difference between life and death, Hoffer and others said. Others were not given earplugs or did not take them along when they were sent into the war zone. And some Marines weren't told how to use their specialized earplugs and inserted them incorrectly. Hearing damage has been a battlefield risk ever since the introduction of explosives and artillery, and the U.S. military recognized it in Iraq and Afghanistan and issued earplugs early on. But the sheer number of injuries and their nature — particularly the high incidence of tinnitus — came as a surprise to military medical specialists and outside experts. The military has responded over the past three years with better and easier-to-use earplugs, greater efforts to educate troops about protecting their hearing, and more testing in the war zone to detect ear injuries. The results aren't in yet on the new measures, but Army officials believe they will significantly slow the rate of new cases of hearing damage, said Col. Kathy Gates, the Army surgeon general's audiology adviser. Considerable damage has already been done. For former Staff Sgt. Ryan Kelly, 27, of Austin, Texas, the noise of war is still with him more than four years after the simultaneous explosion of three roadside bombs near Baghdad. "It's funny, you know. When it happened, I didn't feel my leg gone. What I remember was my ears ringing," said Kelly, whose leg was blown off below the knee in 2003. Today, his leg has been replaced with a prosthetic, but his ears are still ringing. "It is constantly there," he said. "It constantly reminds me of getting hit. I don't want to sit here and think about getting blown up all the time. But that's what it does." Sixty percent of U.S. personnel exposed to blasts suffer from permanent hearing loss, and 49 percent also suffer from tinnitus, according to military audiology reports. The hearing damage ranges from mild, such as an inability to hear whispers or low pitches, to severe, including total deafness or a constant loud ringing that destroys the ability to concentrate. There is no known cure for tinnitus or hearing loss. The number of servicemen and servicewomen on disability because of hearing damage is expected to grow 18 percent a year, with payments totaling $1.1 billion annually by 2011, according to an analysis of VA data by the American Tinnitus Association. Anyone with at least a 10 percent loss in hearing qualifies for disability. From World War II and well through Vietnam, hearing damage has been a leading disability. Despite everything that has been learned over the years, U.S. troops are suffering hearing damage at about the same rate as World War II vets, according to VA figures. But World War II and Iraq cannot easily be compared. World War II was a different kind of war, waged to a far greater extent by way of vast artillery barrages, bombing raids and epic tank battles. Given today's fearsome weaponry, even the best hearing protection is only partly effective — and only if it's properly used. Some Marines were issued a $7.40 pair of double-sided earplugs, with one side designed to protect from weapons fire and explosions, the other from aircraft and tank noise. But the Marines were not given instructions in how to use the earplugs, and some cut them in half, while others used the wrong sides, making the devices virtually useless, Hoffer said. Today, instructions are handed out with the earplugs. In any case, hearing protection has its limits. While damage can occur at 80 to 85 decibels — the noise level of a moving tank — the best protection cuts that by only 20 to 25 decibels. That is not enough to protect the ears against an explosion or a firefight, which can range upward of 183 decibels, said Dr. Ben Balough, a Navy captain and chairman of otolaryngology at the Balboa Navy Medical Center in San Diego. The Navy and Marines have begun buying and distributing state-of-the-art earplugs, known as QuietPro, that contain digital processors that block out damaging sound waves from gunshots and explosions and still allow users to hear everyday noises. They cost about $600 a pair. The Army also has equipped every soldier being sent to Iraq and Afghanistan with newly developed one-sided earplugs that cost about $8.50, and it has begun testing QuietPro with some troops. In addition, the Navy is working with San Diego-based American BioHealth Group to develop a "hearing pill" that could protect troops' ears. An early study in 2003 on 566 recruits showed a 25 to 27 percent reduction in permanent hearing loss. But further testing is planned. And for the first time in American warfare, for the past three years, hearing specialists or hearing-trained medics have been put on the front lines instead of just at field hospitals, Hoffer said. Marines and soldiers are getting hearing tests before going on patrol and when they return to base if they were exposed to bombs or gunfire. "You have guys that don't want to admit they have a problem," Hoffer said. "But if they can't hear what they need to on patrol, they could jeopardize their lives, their buddies' lives and, ultimately, their mission."